Question of Kripadham: Is there a symbolic reading of this story of Hiranyakashipu and Nrisimhadev which can help our sadhana? Swami Tirtha: Yes. In the old times the demons were outside. And they were great ones, so great, that God had to come to finish with them. Today there are also some opposing forces outside also; but rather the demons are inside. Therefore in this age the Supreme Lord doesn’t come with sharp nails, with intestinal colons and in blood, but He comes in a beautiful form as the Golden Avatar; yet He is ready to kill the demoniac tendencies. Otherwise He is very gentle, but this time He helps to fight the internal enemies. Question: It looks like God has turned Himself into a demon to kill a demon. What is the difference between these two demons – the good one and the bad one? Is it the purity of their motifs? Swami Tirtha: Well, although this is like a frightening form, yet I wouldn’t call it ‘a demon’– it’s divine. But you are correct – the external form is fearful and violent. Yet sometimes these powers can also be used in order to protect the dharma. So it’s a special feature that Krishna shows, and devotees worship Him as a protector God. But we can say that different shelters, different protections are needed. 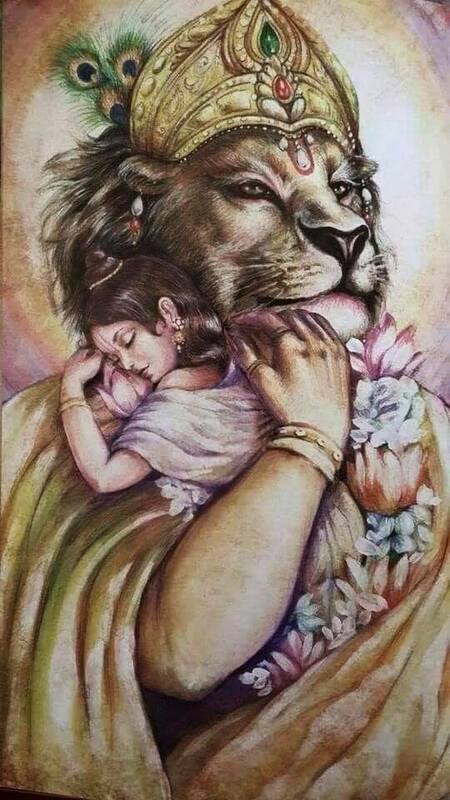 Those who have a kind of fighting spirit, they might take shelter of Lord Nrisimha. But those who are a rasic type, they might take the shelter of Giriraj. That feature also shows the protective power of Krishna over His devotees, in a much more gentle way. Comment: Maybe because of the level of pride. This demon had too much pride, so the gentle way was not good for him? Swami Tirtha: Yes – because he was violent, therefore violent reply came. God will reply according to your question. Question of Lila Avatar: You mentioned that demons are inside us now. If we pray to Nrisimhadev to come and help us, release us from the demons, is there no risk that He can just swipe out our physical body while killing the demons inside? Swami Tirtha: Did I tell you to pray to Nrisimhadev? I said: this time Mahaprabhu comes. He is the Golden Avatar, not the Bloody Avatar. And I’m serious. Because as I have learned from some of my god-sisters: the protection of Nrisimhadev is very violent. So, take care. What is the weapon of Chaitanya Mahaprabhu? Nrisimhadev had the nails, and the teeth, and the power as weapons. Vishnu also has different weapons – like the club, the discus… Mahaprabhu? His hands are to the sky. What kind of weapon can you use when your hands are up? No weapon. 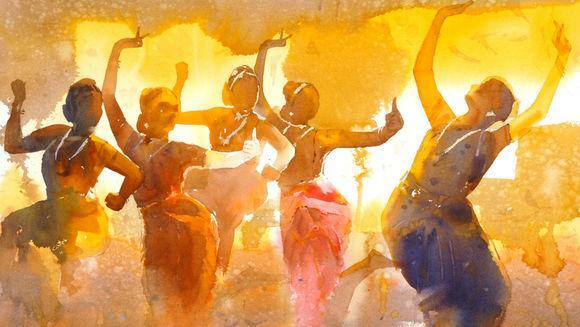 But His weapon is the holy name, some little dancing and maha-prasadam – this is the best way to kill the internal demons today. And this is not some watered down version of the ancient tradition. Because if you dance in front of the altar with hands raised to the sky and jump high, then all the bad emotions and bad thoughts are just thrown out from your system. So this is like a very special yoga technique to activate the body in order to purify it. And also maha-prasadam purifies from the inside. It brings the spiritual quality inside our bodily system. And in this way it will purify the mind, which is the location of negative thoughts. 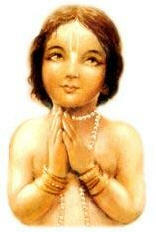 What to speak of the holy name, which has got the most purifying power! So these are very powerful methods, very powerful weapons to fight off all opposition. We have to use them properly. And what is their proper use? Service. So we should not use the holy name, we shouldn’t use the maha-prasadam, we shouldn’t use dancing – we should serve it, we should respect it. And then all the effects will come to you. It’s a science. “Lord Nrisimhadev stopped Hiranyakashipu with the last blow of His mace. All the demigods who had been driven out from Svarga, (heaven) by Hiranyakashipu gathered and started to watch the fight from a hidden place. Just as Garuda sometimes plays with a snake before killing it, allowing it to escape his mouth and then seizing it again, Lord Nrisimha let the demon escape from His hands and the demigods became overwhelmed by fear. The great asura, thinking that Lord Nrisimha was afraid of him, took a brief rest from the fight and then with renewed energy again attacked Him with sword and spear. No one is able to oppose Shri Hari. 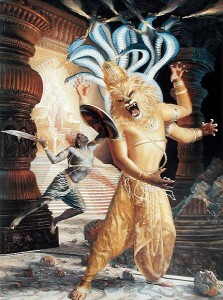 Narayana in the form of Nrisimha turned towards Hiranyakashipu who was laughing loudly. This demon had the power to move in the sky as though he was on the ground, but the Lord caught him in the same way as a snake catches a mouse. The Lord tore apart the body of Hiranyakashipu using only His own nails – that means without the use of any weapon. It happened at dusk, at sunset – which is neither day nor night. 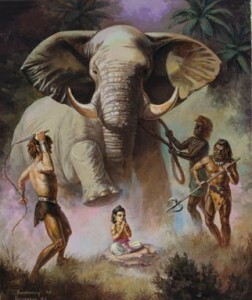 It happened on the threshold of the assembly hall – which is neither indoors nor outdoors; by holding him on His lap – which is neither in the sky nor on the ground.” These were the boons that Hiranyakashipu asked – “so that nobody can kill me inside, outside, neither in the sky, no animal, no nothing…”. But he forgot Krishna, Vishnu; that He can come in any form, He can override all the tricks of the demons. And now here comes a very vivid description: “Then He proceeded to rip out the demon’s entrails and garland Himself with them, so that His white hair was completely drenched with blood. That form of Nrisimha with many arms and a terrible countenance appeared extremely frightening. Finally the Lord plucked out the heart of Hiranyakashipu from his chest and turned to the many thousands of demons, who had rushed to fight Him with so many weapons and killed them with His nails only.” So, mission accomplished. So, this was the sad story of an opponent of Vishnu. Better we try to be lovers of God. We know that this form is very frightening for the enemies of the Lord and very dear to the devotees. Therefore it is recommended to pray for the protection and mercy of the Supreme Lord – in any way, in any form that you are inspired to get this protection. You know that Krishna has two features: He is Dina-bandhu – that means “friend of the fallen”, so everybody is invited; but when we understand that He is also Bhakta-vatsala, “protector of the devotees”, then we are also inspired to come forward. And instead of a fallen soul change our position to a devotee of the Supreme. This is the simple conclusion of this story; be a good bhakta, you will be protected. And the final-final end of the story is always positive. “Lord Shri Hari heard the words of His own servant Prahlada. 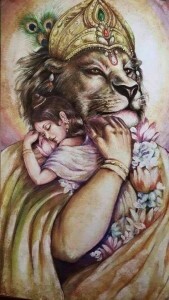 Since He is present everywhere, He appeared in the pillar in His own wonderful form of Nrisimha to support the truth of His devotee’s statement. This frightening form – neither animal nor human – immediately started to kill all the demons. The Lord did not wish to compromise the words of Brahma, who is also a servant of Him, because Brahma promised that Hiranyakashipu will not be killed by any human being or animal, or by any other creature made by him, Brahma, not indoors, nor outdoors, nor by any weapon. The Lord also wanted to keep His own promise “Declare it boldly: My devotee is never lost!” as well as to support the truth in Narada Muni’s words, who said that Prahlada was a devotee of Ananta and therefore could not be killed. For all these reasons Lord Nrisimha appeared. Although He appeared from within the pillar, God is not any sort of a creature. Hiranyakashipu saw this very wonderful form, but he could not see God. For Him this was not God, but a fantastic type of living entity – half-man (nri) and half-lion (simha). To see something in its true light one has to possess the necessary qualities. Otherwise one will not be able to see, even if the object is right in front of his eyes. The Lord is fully perfect in Himself and is self-manifested. Just as it is possible to see the sun only through the power of the sun itself, seeing God is possible only by His mercy, and not otherwise. Only a devoted surrendered soul is able to see God, while non-surrendered foolish people will forever be unable to understand Him. Shri Hari is the greatest and most powerful magician, He can assume any form. If He decides to kill someone, no one can oppose His unlimited power. However, despite seeing this amazing form of Nrisimha, Hiranyakashipu still believed himself to have some chance of defeating Him and brandishing his mace he rushed towards the Lord, roaring and thundering. Like a fly that falls into the fire, Hiranyakashipu disappeared into the glaring light emanating from the body of Lord Nrisimha. We should not doubt the validity of this description of the Bhagavatam, because the Supreme Lord is supremely powerful and can perform anything. At the beginning of creation God destroys the deep darkness by His own power. Therefore it is not surprising that the dark demon can easily disappear into the pure sattvic light of Shri Hari. With great anger and violence Hiranyakashipu attacked Lord Nrisimha with his club, but the Lord responded with His own mace as easily as Garuda devours a large snake. A club or mace is a kind of heavy weapon usually made of iron. Fighting with clubs is indeed a dangerous duel. Among all the demigods Vishnu is the best fighter with a mace. So, we finished our discussion with the sentence that “Pure devotees of Lord Govinda can see God present in all living entities and this is the supreme goal recommended by all the scriptures for the human beings of this world. The sons of the daityas accepted all the instructions of Prahlada and appreciated them very much, thereby rejecting the teachings of their demoniac gurus Shanda and Amarka. Due to their association with Prahlada, the young daityas became firmly resolved in their faith in Vishnu, while the teachers, frightened by this turn of events, went to king Hiranyakashipu to explain what has happened. Hearing the bad news, Hiranyakashipu became overcome by a terrible rage and with his body trembling from head to toe decided to kill Prahlada personally. Hissing like a trampled snake, Hiranyakashipu thundered insults at Prahlada, shouting that the boy is not even qualified to address him. With a very humble attitude and folded hands Prahlada stood in front of Hiranyakashipu, while the king, with a fierce stare hurled cruel words at him: “You arrogant, foolish boy, destroyer of your family! Ah, miserable wretch, how dare you disrespect my commands. You idiot, I will send you to the abode of Yama, the lord of death, right now! Ah dull-headed child, all the kings of the world start to tremble when they see me angry. From where are you getting this power of remaining fearless before me?” Then Prahlada answered: “Ah king, this power of which you speak is not only my power, but yours as well. It is the same power that sustains all living entities living on the land and the water, high and low, starting from Brahma and including all creatures under his control. He is the only supreme controller, as well as eternal time and death. He is the power of the senses and the power of the mind, the power of the body and the soul of all senses, the lord of three gunas, unlimited and capable of conquering anyone. This Supreme Lord is the creator and the destroyer of this world. Please give up your demoniac nature and dualistic vision based upon the concept of friend and enemy. You should see everyone equally, because our great and only enemy is our uncontrolled mind. Beside this enemy there are no other enemies. Those who see others with equal vision are the best among the worshipers of the Lord. In the past foolish people like yourself were also harassed by the same enemy – the uncontrolled mind. Lust, anger, illusion, greed, madness and envy are the thieves who steal away everything from the unfortunate soul. Without conquering them how can we think we have conquered the world? A sadhu who possessed equal vision and controlled mind cannot have any enemy. Question of Paramananda: My question is how to solve most effectively the problems connected with our practice, especially with chanting? And how to raise the quality of our chanting? Swami Tirtha: What was the first part? Paramananda: How to overcome obstacles, difficulties in chanting? Swami Tirtha: What is that? I haven’t seen any difficulty in chanting. So please, try to explain, I don’t understand. Swami Tirtha: Difficult? It doesn’t exist in chanting. 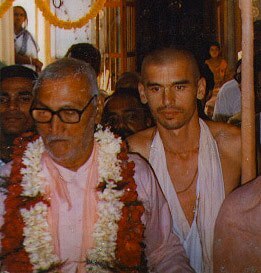 Once Gurudev asked a similar question from Shrila Shridhara Maharaj – this was the question of somebody from the west – he said: “Gurumaharaj, what to do if devotional practice becomes like a routine, if it dries up?” And Shridhara Maharaj said: “I don’t understand.” Gurudev repeated the question. And repeated again. And then he understood that it doesn’t exist for him. For Shridhara Maharaj it doesn’t exist – that devotional life becomes like a dry routine. It was beyond his understanding, he could not imagine it. So, following his example, you will have a very hard time to explain me the difficulties in chanting. Still one difficulty might be there – that we don’t pay enough attention. When we use the maha-mantra as a background noise,it will not help. But the other part of your question – how to improve the quality of our chanting – is very important. By serving those who chant properly – this is the best way, yet it is very subtle. Question of Dragi: The final result of our efforts – is it depending on our efforts or on Krishna’s will? Swami Tirtha: I would say both. Of course Krishna can save you even against your unwillingness, but it is easier for Him if you say ‘yes’. As bhakti is a descending process, everything comes from above, but if we do nicely, then it helps the process to happen quicker, faster. By the grace of the Lord and the guru, the seed of bhakti is planted in the heart of a devotee. So we can say it depends on them. And what is our duty? Our duty is to cultivate our garden. Then the seed will grow nicely. Question of Hayagriva: One part of the story of Prahlada was the story of Yamaraja who consults the widows of Hiranyaksha, and we see that Hiranyakashipu understands perfectly the philosophy that he is not the body, but he hasn’t actually realized this. How can we realize practically that we are not the body? Swami Tirtha: It’s very easy – avoid riding in the car of bad drivers. Because if somebody is a bad driver, you as a passenger are frightened of death, of accident and that increases your bodily consciousness. But you know, the answer of all the ‘how to’ questions is one. So, ‘How to realize that I’m not the body?’ Chant more! But I don’t want to use it as an excuse. Well, slowly-slowly, by facing all the anarthas, by purifying ourselves and coming closer to our final atman identity, the bodily consciousness should diminish. Easy to say ‘We are not the bodies’, but practically our body in the present situation is the only instrument by which we can relay to anything outside. With your hand you can take the Gita, with your eyes you can read, with your brain you can understand, right? So body is very important. Yet the body is full of necessities. It’s a biological construction. So in order to function nicely you have to feed it, you have to give it a little sleep, you have to give it a little enjoyment here and there, because otherwise it doesn’t function. Just like a car – without fuel you cannot use it. In the same way we should take care of this instrument which is given to us, just like a car, to reach the goal. The body is not a worshipable object, but this is an instrument that you can use in your spiritual progress. 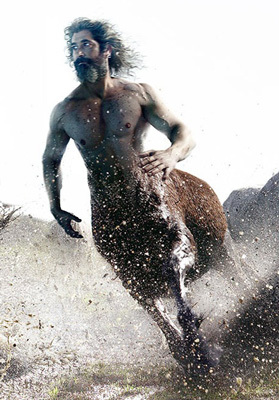 A human being is just like a centaur. In a centaur one part is human, the back side is animal. We are like this. We have some very basic, biological, animalistic instincts; and we have a front part with some little brain; you can look up to the sky. Your animalistic back side cannot look up to the sky. But still it is coming with you. What to do! Yet if we engage the body nicely as an instrument in reaching our spiritual goal, it will help us. We are conditioned by the body. Therefore it is very much suggested that devotees should analyze themselves and find their real identity. So once we have to understand that we are separate from the body. Body is there, but we are different. Therefore of the two phases of the spiritual progress the first is to capture the conscious identity. Even that is difficult. But the second one is more difficult, because then this captured conscious identity has to be dedicated, we have to put it at the lotus feet of the Lord. So these are the two phases: control yourself, be a master of your existence; and then dedicate yourself to the Supreme. And I think theoretically we can all agree: ‘Ah, yes, I’m not the body!’ But when your breakfast is missing, some signals start – the body will say: ’I’m also here!’ So, how to realize it? First try to have the theoretical understanding, then try to act accordingly – but this is the mechanical process. If we directly realize that ‘I belong to the Supreme, I’m a citkana, I’m a particle of divine light, divine consciousness’ – then this is the revolutionary way, the direct way. And by chanting, by following all the other services given to us, slowly-slowly these layers of material consciousness are removed. Where did you get your knowledge? So, Prahlada instructs his schoolmates, showing that time and human life is very valuable, and finally stressing that to serve Vishnu, the Supreme, is much more important than anything else. 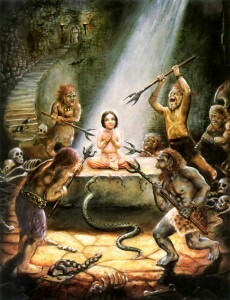 At the end the demon boys were amazed to hear that Prahlada was a student of Narada. Because they inquired: “Where did you get your knowledge?” And then Prahlada said: “Ah, I have learned it from Narada.” “How! How possible!? 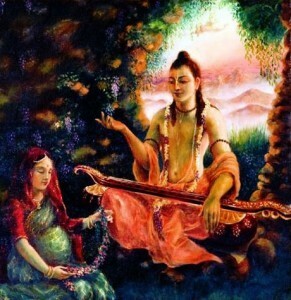 You didn’t meet him!” But while Prahlada was in the womb of his mother, the mother met Narada Muni. So we can say that Prahlada had a prenatal education. So, dear mothers, take care! When a new life is under your hearts, don’t be angry, develop very-very good consciousness. Because there is communication between your child and you. So whatever you do, whatever you think, whatever you hear is being transmitted to the child. You can give good training to the future son or daughter. For example, if you have your child in your womb and all the time you quarrel with your husband, it is this type of training you give. And when the small girl comes, this will be her nature – quarreling. It’s possible. 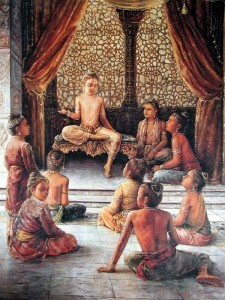 But if you read the Bhagavad Gita, the child can become a scholar of devotional knowledge, science. Yet beware, if he or she is a great soul and you make a mistake in reading the Bhagavatam or the Gita, they may kick you from inside. It really works – there is a chance to influence, to communicate, to teach certain things to the child in the womb, because he or she is conscious. Life starts at the moment of conception. So there’s a conscious entity inside the body. Therefore bringing new children to the planet Earth is like a very great service. That means commitment to God doesn’t depend on age. If you are young, you can do it, if you are old, you can do it. Although we use these qualities as excuses: ‘Ah, I’m too young, I cannot join. Ah, now I’m too old, why should I join, I cannot.’ We always use the excuses. But we shouldn’t waste time, because we cannot change the current of time and we cannot bring back even one moment. So we should use the time properly. Therefore every single moment of human life is extremely valuable. So, this calculation says: hundred years of lifespan, for fifty years you sleep, for twenty you are ignorant as a small child and you play; and then at the end there are some ten-twenty years of disabled condition – so how much is left? Not so much, right? We have ten good years. Why should we waste these ten years with stupid activities? We have to be careful about time. Because in that active period of your life you can determine your future – that you will later either enjoy or regret. Activities will definitely bring results. And the karma-phala, the fruits of our activities, will be distributed – if you like it or not. So we should be careful about our activities. So, for the sake of higher integrity sometimes we have to sacrifice a lower, smaller principle. In order to save the body, sometimes we have to sacrifice one limb. In order to save our family, we have to sacrifice ourselves. In order to save our village, we have to sacrifice our family. In order to save our country, we have to sacrifice our village. So we should always try to see what the higher principle is and adjust to it. Although it is painful to bring this sacrifice, yet it should be done.